2 Bedroom Flat For Sale in Bury for £79,995. 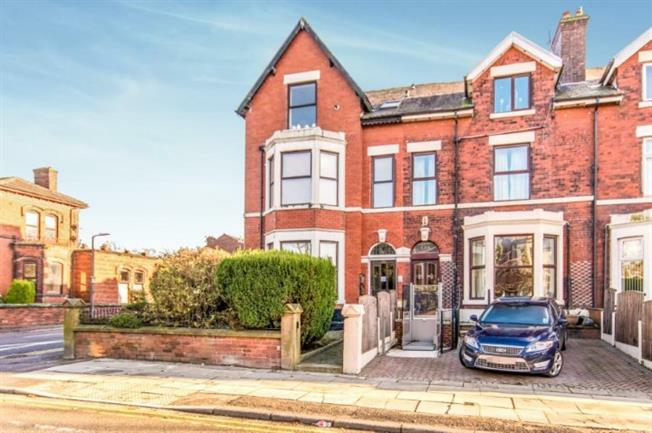 Ground floor apartment with beautiful bay fronted lounge, wooden flooring, open plan kitchen area with granite effect worktops and integrated appliances, Two bedrooms and shower room. Would be ideal for first time buyers or anyone looking for a property that is easy to manage and conveniently located close to transport links, shops, schools and local amenities. Wooden flooring, bay window, open plan to kitchen, electric storage heater, spotlights, TV aerial point, chrome plug sockets, wifi point. kitchen area has stainless steel sink, breakfast bar, integrated hob and cooker, granite effect worktop and floor units. Single room with carpet, window, light point and electric heater. Shower room with white suite, black slate effect tiles behind shower, spotlights and tiled floor.